Animals are always loved by everyone. Puppies and kittens, dolphins and pandas! Well, how about owning a bracelet or a beautiful pair of earrings made of your favorite pet or favorite animal? Yes, that is actually possible now because “The Peruvian Bead Factory” is here to render you the most extraordinary Peruvian Beads & Pendants! We are a firm with a motive to promote these products in the market and enhance the style of the fashion jewelry market and the beading making industry. 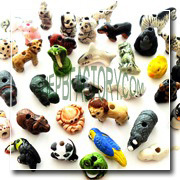 Our online store has an amazing range of Animal Shaped Beads. They are created professionally and made with the top-notch materials. Moreover, our range of products is available in many shapes and sizes. Every piece in the different categories is ideal for creating a bracelet, necklace, pair of earrings or anything you wish to make! 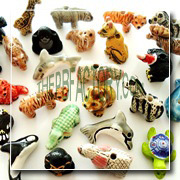 We offer the widest variety and the best quality of Animal Shaped Beads you will find out there! We give you a chance to show your creativity to the world with the use of our mesmerizing animal beads. 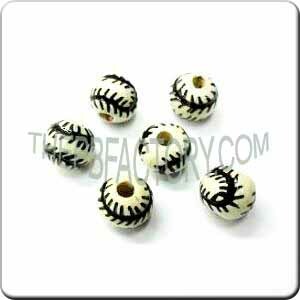 Simply choose the best size, animal type and color effortlessly from our wide collection of beads. 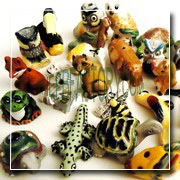 Our small animal Peruvian beads are very cute and full with information and are designed especially for earrings! So allow us to serve you in looking your best and the most fashionable among all with our incredible products. For any assistance, our customer support professionals are available to serve you.